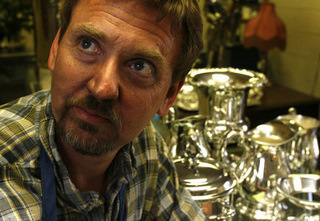 Blix Thompson has been involved with silver restoration since 1969, learning the trade from his father, Don Thompson. Blix is also an avid silver collector himself. He loves sharing his knowledge and love of silver with his clients. Blix enjoys speaking engagements with collector groups including the Questers. He was a featured speaker at the 2010 National Convention of Questers held at the prestigious Arizona Biltmore Hotel. He has also been featured in numerous articles including the Tribune, Arizona Republic, Phoenix Home and Garden, Phoenix Magazine.